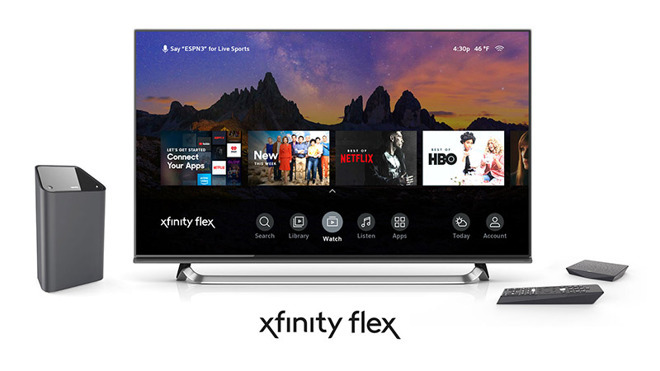 Xfinity Flex debuts March 26. With an official launch date of March 26, Flex costs existing customers $5 a month and comes with up to two 4K HDR set-top streaming boxes, Comcast's X1 voice-enabled remote control, an integrated content guide and support for smart home appliances. Comcast says Flex offers access to more than 10,000 free online movies and TV shows through services like ESPN3, Xumo, Pluto TV, Tubi TV, Cheddar, YouTube and more. Subscription products like Netflix, Amazon Prime Video, HBO and Showtime are also supported, while users have the option to rent and purchase individual shows from a digital store. Further, customers can link their Movies Anywhere account to watch content from their digital lockers, and listen to online radio services Pandora, iHeartRadio and XITE. The content guide appears to be Flex's main draw, as competing streaming devices from Apple, Amazon, Roku and others provide access to a similar assortment of digital streaming apps without the attached monthly hardware fee. Ported from the Xfinity X1 platform, the guide streamlines content search, browsing and viewing by aggregating video and audio programming in a centralized repository. Additional benefits include Xfinity network monitoring and management options, parental controls and integration with home automation hardware like security cameras. "For just five dollars a month, we can offer these customers an affordable, flexible, and differentiated platform that includes thousands of free movies and shows for online streaming, an integrated guide for accessing their favorite apps and connected home devices, and the ease of navigating and managing all of it with our voice remote," said Matt Strauss, Executive Vice President of Xfinity Services for Comcast Cable. Flex will one day serve as an upgrade path to Comcast's full-fledged Xfinity X1 cable service. According to the company, users will soon be able to subscribe to an X1 cable package directly from Flex's integrated guide. Flex goes live one day after Apple is expected to unveil its own video streaming service at a special event in Cupertino. Details are scarce, but reports suggest the tech giant plans to run a type of video subscription services hub bolstered by free-to-view original content. AppleInsider will be covering Apple's event live from Apple Park on Monday, March 25, at 10 a.m. Pacific, 1 p.m. Eastern. Any predictions for how long before Comcast discontinues not just this service but also the set top box? Is the service also available on phone and tablets or only via the Comcast Box? Is the box free or purchased or is it rented monthly? A monthly fee for the box should be added to the monthly price. Competition is good. Time will tell. Comcast may keep their boxes for a while since they are well funded but I think they will lose customers to Apple. Maintaining the software and features on those Comcast boxes may also suffer. People also want to take their streaming anywhere instead of being tied to their TV at home. I think Spectrum made the best decision by leveraging the AppleTV for their content. Comcast? Thanks but NO WAY! Comcast, the upsell specialists. You start with an appealing plan, and then find out all the catches: gotta pay extra for HDTV, DVR, second receiver, then you have the 1TB cap which seemed reasonable a couple of years ago but is actually very easy to hit if you stream 4K movies regularly. And then of course after your guaranteed rate period expires your bill goes through the roof, because "this was a special rate and it's no longer available". It's a hideous company with deceptive practices, and I can only recommend to stay as far away as possible. You would have to waterboard me 800x before I would consider it. Even then, no. Those miscreants will never get a single dime from me for the rest of my life. This could be instructive — seems likely Comcast knows something about the deals Apple has made for (non-Apple) content and this is their response, which has to have been in the works for quite a while. The instructive part will be in how Apple’s service compares/contrasts to this. But, the alternative is FiOS which is no better -- both are better at scams than anything else. 40 years ago when all this started cable operators were closely regulated as utilities. We need to return to that model. But, it is not just $5.00 a month. "The Flex box also only works if you lease a Gateway router from Comcast, which costs an extra monthly fee." Comcast confirms this on their website, https://www.xfinity.com/learn/flex, "no long-term contract | only for Xfinity Internet customers | xFi Gateway required"
"Flex automatically connects to your xFi Gateway, so you can quickly access your favorite services and manage your WiFi — all from one simple menu." When Comcast tried to force me to use their gateway, not sure if it was the latest xFi Gateway, I promptly took it back since it locks you into their environment without any way to use existing Airport devices. This box gives Comcast way too much access to everything entering the house as well as everything done inside the house. --No thank you, I'll use my own cable modem and routers and will stay away from this service. Agreed - broadband is virtually essential for life these days, and not just so you can stream Game of Thornes. Unfortunately, with Ajit Pai as head of the FCC I doubt things will change anytime soon. Cable companies have a virtual monopoly in the majority of markets - we have a choice between Comcast and nothing (ok, maybe satellite,) and we live in a new development with new utilities. Years ago I bought a cable modem to avoid the monthly rental fees ($10 per month for a $100 modem) and comcast still periodically tries to start charging me again. I will say that our internet service has been very reliable, so I’m not dissatisfied with it. Some day, if/when 5G infrastructure actually gets built out so that it covers enough areas it may become a viable alternative to cable broadband, but that’s still years away. Monopolies tend to charge as much as they can while delivering as little as they can. That's why we started regulating them back 100 years ago. But now we are all about so called "free markets" and "No government control of our internet!". It illustrates the power of propaganda over weak, poorly informed minds. Comcast is marketing the mobile broadband which relies on their WiFi hotspots for bandwidth. And those WiFi hotspots are mostly the routers that they are renting to us. So, by pushing this "Flex" program they are really pushing people to rent their routers. That is so slick! You are paying Comcast so that Comcast can use the router you are paying for to power their mobile network! Comcast might be crooks -- but they aren't dumb! Tom Sawyer could not have done it any better --- getting neighborhood kids to pay him to be allowed to paint his fence!